The Upgrade Assistant is not just a reporting tool, but also a gateway into the various purchasing options for Windows 8.1. 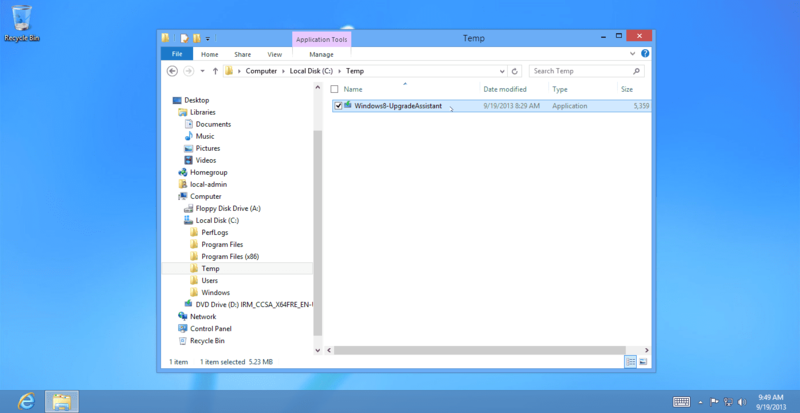 As of this moment, you must run the Upgrade Assistant tool in order to purchase Windows 8.1 or Windows 8.1 Pro online, however you can also run it without purchasing, and generate a compatibility report with which to analyze your applications and computer settings and their ability to work properly in Windows 8.1. 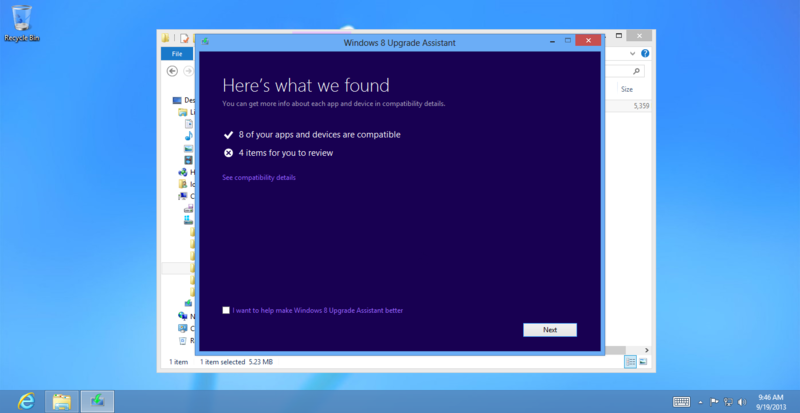 Today I’ll show you how to upgrade to Windows 8.1 with Upgrade Assistant. 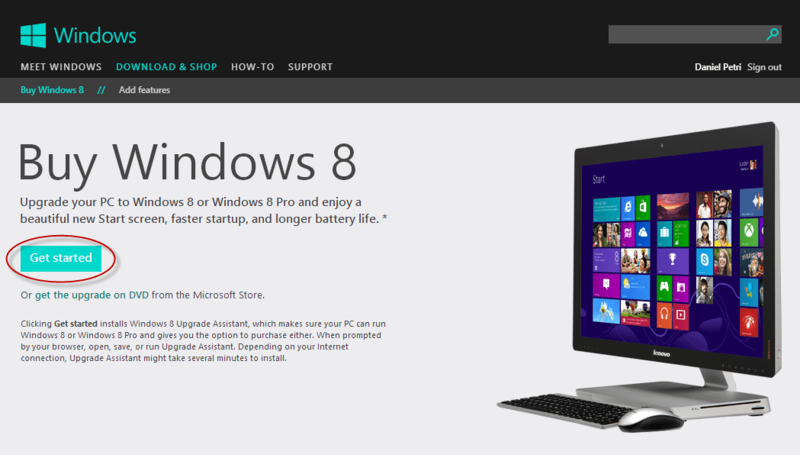 Note: Any PC that successfully runs Windows 7 will also run Windows 8.1. To start, first you need to download the Upgrade Assistant tool. After downloading the Upgrade Assistant (approx. 5.5 MB), run it from the download folder. You may be prompted to run the tool with elevated permissions. Click Yes to proceed. There is not much you can do at this moment. After a couple of moments of waiting, the process begins without being prompted to do anything. 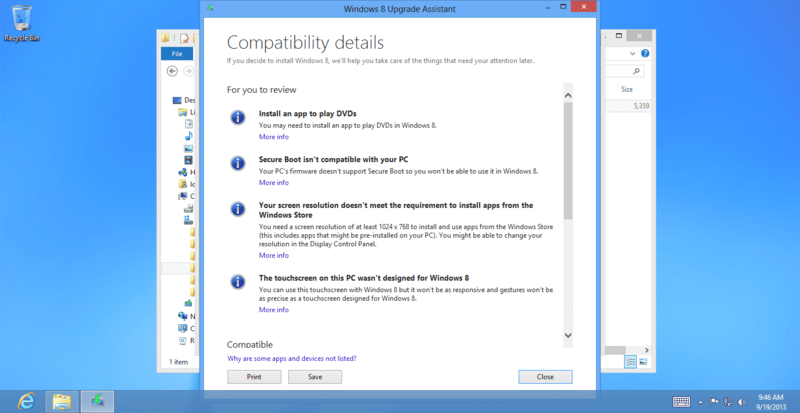 When you click on See compatibility detailsyou are presented with a compatibility details window that is basically a list of all the apps, drivers, and system settings that are not compatible and/or may not work correctly in Windows 8.1. You can print and/or save the report. The resulting list you may see may vary, of course, because no two PCs are identical, and no two PCs run the same sets of applications. For more info on specific products and applications, check the Windows Compatibility Center or contact the product or application manufacturer. Next you will get an option to purchase Windows 8.1. In my demo environment I was not able to get the purchase options because at the moment of writing this article these options were not yet publicly available. Once purchasing options are made available, you will be able to buy the right version of Windows 8.1, depending on your country.